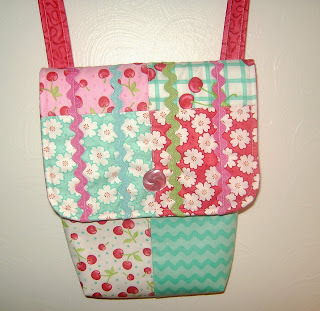 Kaisha said Anna needs a little bag to carry when they go shopping. I saw this cute pattern on All People Quilt and downloaded it yesterday. It was supposed to be strip pieced but I had this new charm pack called Oh Cherry Oh that I picked up last week, cute and girly looking. I had fun making it, but didn't get it done in time to put it in the package with the snow pants I sent yesterday. So I made a little raggy wallet to go inside the bag and will get it sent when I go to the PO tomorrow. 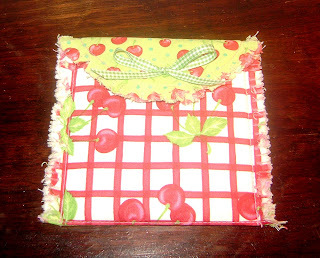 I have three plastic bins full of buttons, but couldn't find a cute red button for the wallet so I just glued a lime green gingham bow on the front and put a velcro closure on the flap. Today I had to go to the fabric store for more quilt kit fabrics. I didn't know flannels were on sale this week for $2/yd, that was a nice surprise. I couldn't find a whole bolt of white so had to have her unroll the bolt and measure. A full bolt is 25 yards, the one I got ended up being 23 yards and then we had to roll it all back on the bolt. I was out of pink and blue flannel again already so got 10 yds each of those. So now I can get back to work. But it was fun taking a break and making the little purse. I hope the kids get the package tomorrow. Anna has had to stay inside for reccess because she doesn't have any snow pants that fit her. Kaisha said she looked everywhere and the stores have swimsuits out now and she even tried bidding on some on ebay but got outbid by 50 cents. I happened to be in Wally's the next day and figured I would check and see if they had any. I found two big racks of snow pants on clearance! No snow in Colorado this year so I guess they didn't sell. Also, Marcia said they let her kids go out without coats when it is freezing here. I heard her yelling at one of the teachers at the car pool lane one day when they sent the kids out in short sleeve shirts with no jacket. She always calls me to chat while she waits in line. It was very cold and windy that day and it does seem that the teachers should have enough sense, huh? I guess New England teachers still do things the old fashioned way.